(a) Measure the line pressure. The line pressure test should always be carried out with at least 2 people. One person should observe the condition of wheels and wheel chocks while the other is performing the test. Be careful to prevent the SST hose from interfering with the exhaust pipe. This check must be conducted after checking and confirming that the engine is normal. Do not perform the stall test for longer than 5 seconds. 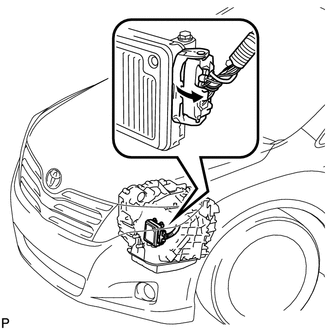 (1) Warm up the Automatic Transmission Fluid (ATF). (2) Lift the vehicle up. (3) Remove the engine under cover. (4) Remove the test plug on the transaxle case front left side and install the SST. (6) Fully apply the parking brake and chock the 4 wheels. (7) Connect the Techstream to the DLC3. (9) Enter the following menus: Powertrain / ECT / Active Test / Control the Shift Position. (10) Move the shift lever to D, and then use the Techstream to hold 3rd gear using Active Test. Measure the line pressure while the engine is idling. (11) Turn the ignition switch off. (12) Disconnect the connector of the TCM. Disconnect the connector only when performing the D position stall test. (14) Firmly depress the brake pedal, move the shift lever to D, depress the accelerator pedal all the way down, and check the line pressure while the stall test is performed. (15) Turn the ignition switch off. 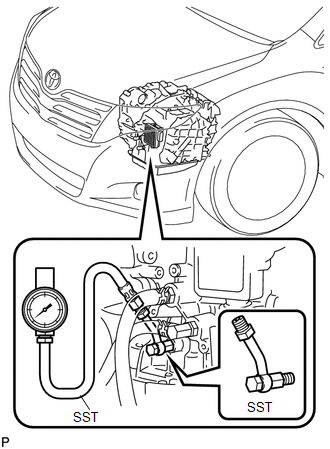 (16) Connect the TCM connector, depress the brake pedal firmly, move the shift lever to R, and check that the line pressure while the engine is idling and during the stall test. (17) Remove the SST, install the test plug.